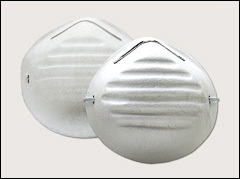 Dust masks, particulate respirator masks, particulate masks, disposable respirators, respirators, safety masks, respiratory protection, protective workwear. 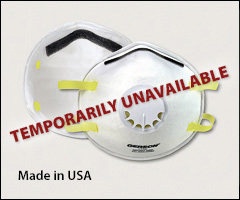 Other brands of disposable respirators, such as 3M and North are shown on our Disposable respirators page. 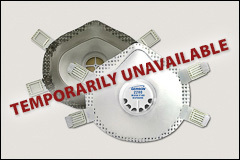 Other respirators with replaceable cartridges and filters are shown on our Full face respirators and Half mask respirators pages. 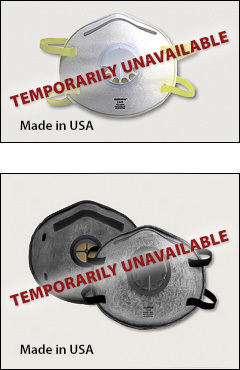 Items listed below are NIOSH approved particulate respirators, except the G1810, which is a non-approved dust mask. All masks listed below are one size fits most. Not NIOSH approved and does not provide lung protection. Economical protection from dust, pollens, and other non-toxic airborne nuisance dust. Metal bridge support on nose helps to contour these masks to your face. Straps are ultrasonically welded - not stapled. Comfortable fit conforms to most faces. Sold by the box, 50/box. Features latex-free and staple-free head straps. Soft foam nose cushion on inside of mask and aluminum nose-clip contours mask for a comfortable fit. Electrostatically-charged filter media provides low inhalation breathing resistance. Durable, double-shell construction for long life and better value. G1816 includes an oversized valve to easily expel hot air for cool comfort. G1815 is cleared by the FDA for use in surgical environments. Sold by the box. G1815 packed 20/box, 12 boxes/case. G1816 packed 10/box, 10 boxes/case. from only nuisance levels of organic vapors and acid gas, through a layer of activated carbon. Nuisance level refers to concentrations not exceeding OSHA PEL or applicable government standards for exposure limits, whichever is lower. 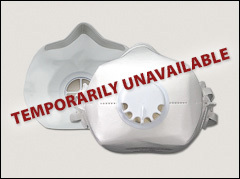 Do not use for respiratory protection against these vapors and gases. Collapse resistant double-shell construction. Soft foam nose cushion on inside of mask and contoured formable nose-clip helps reduce fogging. Smooth, latex-free and staple-free polymer head straps won't catch on hair. No pre-stretching needed. Sold by the box. G1820 packed 20/box, 12 boxes/case. G1821 packed 10/box, 10 boxes/case. Latex-free and staple-free polymer head straps that won't catch on hair. Collapse resistant double-shell construction. Soft foam nose cushion on inside of mask and contoured formable nose-clip helps reduce fogging. G1826 includes an oversized valve to easily expel hot air for cool comfort. Sold by the box. G1825 packed 20/box, 12 boxes/case. G1826 packed 10/box, 10 boxes/case. Flexible-edge technology provides better fit in a greater range of facial sizes. Respirators must be fit tested to assure suitable fit. Patented design provides greatest comfort and lower breathing pressure. Features latex-free and staple-free head straps and a contoured formable aluminum nose-clip. Sold by the box, 10/box. Flame resistant, durable material. Double-shell construction for long life and better value. Oversized valve easily expels hot air for cool comfort. Sold by the box, 10/box. from nuisance levels of organic vapors and acid gas through a layer of activated carbon. Nuisance level refers to concentrations not exceeding OSHA PEL or applicable government standards for exposure limits, whichever is lower. Do not use for respiratory protection against these vapors and gases. Soft foam nose cushion on inside of mask and contoured formable nose-clip to help reduce fogging. Smooth, latex-free and staple-free head straps won't catch on hair. No pre-stretching needed. Oversized valve easily expels hot air for cool comfort. Sold by the box, 10/box. Flame retardant outer shell. Full foam inner gasket helps provide a good seal and is comfortable to wear. Heavy-duty, adjustable head straps. Oversized valve easily expels hot air for cool comfort. Sold by the box, 5/box.